One of the cool things about Android is all the things you can customize. And lately there have been a few keyboards coming out or receiving major updates. 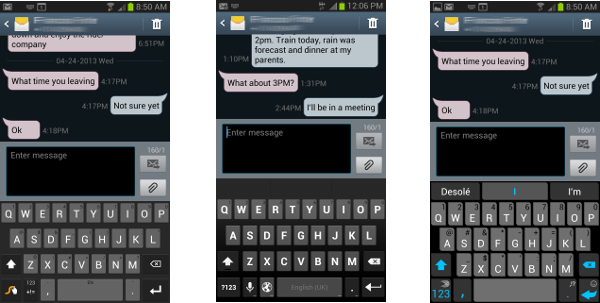 I took a look at three of them: SwiftKey, Swype by Nuance, and Android 4.2’s keyboard (available for 4.0 and up). There are a lot of keyboards to choose from, but these are among the most popular and most often cited in the media. All these keyboards feature gesture typing, multiple languages, and user dictionaries. The aspects I compared include: ease of use, accuracy and prediction, speed, and unique features. SwiftKey’s number one feature is that it supports multiple languages simultaneously – no need to switch manually before typing. This is pretty cool for someone who regularly writes in two languages. The keyboard also features arrow keys that are convenient when your fingers are too fat to position the cursor correctly with a stab. Swype’s number one feature is the Swype short-cuts that enable everything from editing (copy, cut, paste, selection) to changing modes (alphabetic versus numeric). In fact there are enough short-cuts that mastering them would make you a Swype-ninja! Both SwiftKey and Swype feature alternate characters on each key that are accessed by long-pressing, so it’s much easier to insert symbol characters and numbers. Android’s keyboard is straight forward and simple to use, and although some of the more advanced features exposed by SwiftKey and Swype are longer to reach the un-cluttered interface is very appealing. One thing that is sorely lacking is the alternates for each key, usually available via long-press, that are found only via symbol mode. Swype is the most accurate keyboard of the three, but SwiftKey is working in two languages (English and French) without missing too many words so that’s quite impressive. The Android keyboard does a pretty good job too. The fastest of the keyboards for me is Swype. The slowest is the Android keyboard, but only when the hovering prediction is activated. The SwiftKey keyborad is just as responsive as Swype. Each keyboard has some thing it does a little differently than the rest. In the case of the SwiftKey it also featured more skins or styles than Swype and has pretty cool looking gesture-trail. What made Swype stand-out to me was Swype’s crowd-sourced dictionary if you choose to participate in their Borg collective. Of course the Android keyboard features pure Android goodness! But most interestingly it hovers the predicted word along the gesture trail so you can keep your eyes focussed, no need to keep looking above the keyboard to see which word is being inserted. In the end I always come back to the Swype keyboard. I really appreciate the accuracy, the short-cuts, and clean interface.